During the ArtCOP21 Professional Workshop organised last December in Paris, France, ASEF Culture360 contributor Florent Petit met with Russian artist Igor Ponosov and Anton Polsky, members of the collective Partizaning. 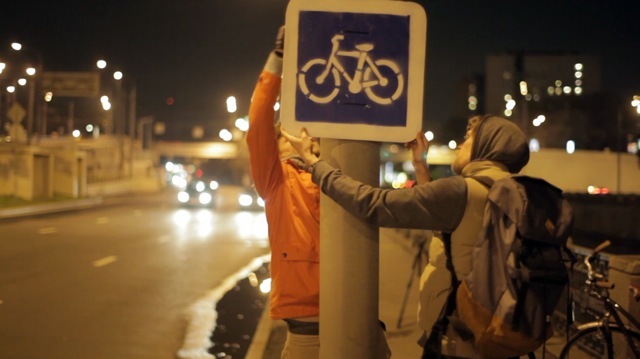 In this interview they share their project on how to make Moscow more bike and pedestrian friendly with “Do It Yourself” actions. Well, it’s a difficult question. 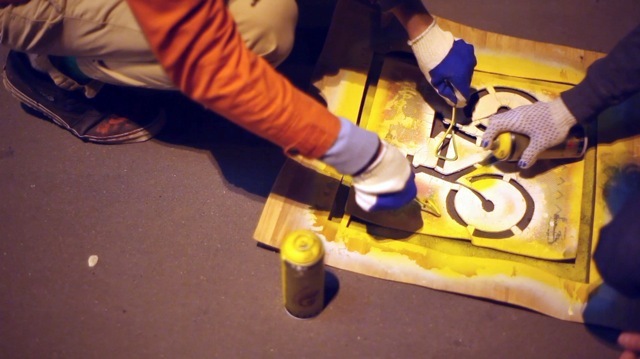 We started as street artists. But now, to be honest, we hate street art… It’s all about doing pretty or funny images and we don’t find this too interesting anymore. We still work in the city, but with different tools and actions, using banners or creating site-specific works for instance. During the ArtCOP21 professional workshop you participated in, you have said “the best way to improve cities is to do it by illegal ways sometimes”. Could you elaborate on this? Often, the standard procedure is too long; it takes you so much time and energy: it is simply not working in Russia. 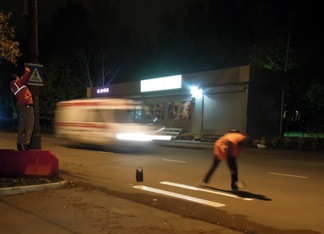 For example, in one district where people were willing to have official crossroads, they sent requests to the local authorities but nothing happened; so we decided to paint white, visible crossroads signs on the road at night. Grassroots initiatives can have a strong power in cases like this. We worked for four years on our bicycle project in Moscow, drawing signs for bikes on the floor, marking the road to create bicycling paths. The funny thing is that the government authorities invited us afterwards. One of the activists involved with us on the project is now working within a government authority to develop and improve the mobility and travel conditions of cyclists in Moscow. So I do think our primary action was successful. No, you can keep the “playground” term. What we do is serious and important for us, that is for sure, but there must be a part of fun in it as well. OK, but what kind of feedback do you have from the residents? In most cases it is a positive reaction. What you must realize is that in Moscow, after the end of the communist era, collective activities were considered a bit suspicious, especially for older generations. It is maybe easier with younger people. The fact is now, with our bicycle project for example, we got so many good reactions from the citizens, some of them found it funny actually. Most recognized we were doing something absolutely concrete, in real life, useful for them. Sometimes we face some negative reactions though. We were once working in a problematic marketplace, trying to involve locals in a participatory event and it didn’t take us long to understand that people were not understanding our action at all. We didn’t get a positive reaction from them. But these things can happen. What is your overall appreciation of this workshop? I do appreciate being with people who do similar things, but I must admit we are all working in different contexts and environments, making it sometimes quite hard to connect with them and their ideas. It is difficult for us to clearly see what can come out of this.